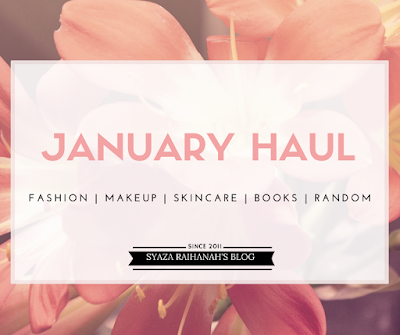 My very first haul posts on my blog. Every month I will update an entry about everything that I bought in that month. Always wanted to share with you what I bought so if its good product/things, maybe you can give a try? Why not, right? So, without any further, let's jump to the haul!!! How can I resist when Papa offers me to get something during a shopping? Haha. I got that jelly sandal when I went to Johor Premium Outlet last few weeks. We entered an outlet named as Rubi that sells a lot of accessories like shoes, bags, sunglasses, purses, and others that offers you an affordable price. After a while, Mama chose one sandal and I pick up that black jelly kind of sandal. My size actually was 39/40 but maybe its out of stock so I took 41 instead. Glad that it still fit and not too loose. It looks so cute yet simple. I also think that when I wear it, it feels so light and I don't have to care much since it's a jelly type. So, if the sandal got dirty, I can just wash it off using water without worrying it gonna ruin. Smart, right? haha. The sandal was RM 15.00. Very affordable price even I saw they sell a cute designed sunglasses for RM 8.00! I always wanted to try facial mist for a long time. There are a lot of choices and I can't choose one until I accidently watched the advertisement about this product on tv and Instagram. I also surveyed some other brands regarding the face mist. Compared the price, quality, performances and all until I decided to try Nano White Fresh Miracle Mist. I chose it because I'm the type of person who easily attracted to buy something just by watching their advertisement on tv and Instagram. Yeah, I'm that type of person. I bought it because it claims that specially formulated for oily skin and its does contain tea tree oil which is perfect for someone who has acne-prone skin. Wait for the review, okay? Oh, the price for this mist is RM16.40 at Guardian. I wanted to add a few new eyeshadow for my collections so end up buying two eyeshadow from Elianto. It's hard to choose which colour that I want and suitable for me because there are a lot of colour selections there. After swatches a few colours at the back of my hand, I picked up colour Cream and Caramel. Cream for the eyelids while Caramel I can use it for the outer corner of my eyes. It looks so pretty. But, the shimmer was so strong and a lot! It's still there even though I've washed it. Hmm. But, overall its a nice eyeshadow from Elianto. The pigmentation for both colours is different. The Caramel one is so nice and more pigmented than the Cream one. I don't know, maybe it because Cream is lighter and yellowish so it doesn't appear much on the lids. The price for the eyeshadows is RM9.90 each. Now, you know that I'm obsessed with eyeshadow. Do you? Haha. The first cream eyeshadow I ever have. Not regret buying this cause it is so beautiful. Too bad that the other colours are sold out at the moment at the store. I used it as a base before I put any eyeshadow so that it stay longer. The pigmentation was not bad and I think if I put other eyeshadow on top of it also would make it more vibrant and pigmented. The price is RM18.90 at Watsons. Bought this because of a YouTuber, EvangelineHawa. She used it as a powder foundation and its look good on her. This product cover up the blemishes and scars pretty well even though you still can see those a bit. I think why not I give it a try. Buying the refill one because it will be easy for me to put in my makeup bag since it does not take so much space. Can't wait to try it! Hope it looks well on me too. Yeah, that is all that I bought in January 2016. I know it is more to makeup thingy. I just want to add a new makeup of my small makeup collections. Haha. Wanna know what I bought for February? Wait for it, okay? Kalau rajin, updatelah pasal face mist tu sekali. Teringin nak pakai tapi masih ragu2 dengan hasilnya.